A yucca plant is a woody, perennial shrub belonging to the Agavaceae family and a native of North America. Growing up to 10 feet tall in some varieties, yucca plants are known for their sword-like 2-and-1/2 feet long leaves. Their towering flower stalks can reach 8 feet high and hold creamy/white blooms from late spring through summer. While yucca plants thrive in warm weather, growing best in zones 5 to 10, they can withstand temperatures down to 10 degrees F as long as they are protected well during cold winters. 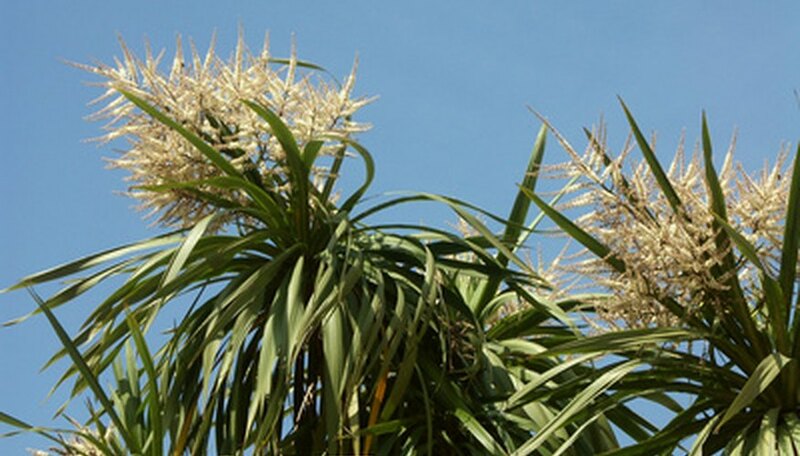 Stop fertilizing the yucca plant the end of summer to begin preparing it for the winter months. Fertilizing after August will encourage new growth on the plant which will be too tender to survive the cold winter months. Reduce the amount of water in late summer that the plant receives and stop watering in September. Yucca plants stop storing water in their leaves during the dormant stage, protecting it from deep freezes. Cut back the flower stalks after they have turned yellow and died back in the fall. Cut the stalks clear back to the ground. Let the stalks naturally die back before cutting to allow the plant to store needed nutrients from the roots for next season's growth. Apply a 6- to 8-inch layer of mulching material over the plant in late fall before the first frost, to insulate and protect it from cold winter weather. Use shredded bark or raked leaves from the yard, and place directly over the plant. Place a piece of plastic sheeting or burlap over the top of the mulch to further insulate. Hold down with either stakes or large rocks placed around the edges. Remove the sheeting and mulch in the spring after all chance of frost has passed. Wear garden gloves when cutting a yucca plant to avoid cuts from the spiky leaves. Do not water a yucca plant after September.